A) No condition or stipulations, which are attached to the customer’s proposal or contract, and which are inconsistent with these terms or which add to or modify them in any way, shall have any effect, unless expressly accepted in writing by Warwick Web Design at the time of acknowledgement of each separate order. In the absence of such acceptance, the customer shall be deemed to have withdrawn or waived their conditions or stipulations and to contract solely on these terms. B) It is not necessary for any Client to have signed an acceptance of these terms and conditions for them to apply. If a Client accepts a quote then the Client will be deemed to have satisfied themselves as to the terms applying and have accepted these terms and conditions in full. Please read these terms and conditions carefully. Any purchase or use of our services implies that you have read and accepted our terms and conditions. C) All orders must be in writing. A) After acceptance, orders shall not be subject to cancellation or alteration, except with the agreement of Warwick Web Designn in writing and signed by an Warwick Web Design. B) Cancellation of orders for sevices especially made to customer’s specifications cannot be accepted. C) Cancellation or alteration charges will be applicable, to cover the cost of Warwick Web Design administration. A) Agreed payment terms will be set out on the proposal or contract unless otherwise agreed in writing and signed by Warwick Web Design. C) If payment is not made in accordance with the agreed terms set out on the order form, Warwick Web Design reserves the right to charge the customer an additional £50.00 on top of their outstanding invoice every 10 working days after the payment due date. D) Failure to make due payment for any product, under these terms, or any other contract between the customer and Warwick Web Design, shall entitle Warwick Web Design to delay, suspend, or cancel works in whole or in part at its option, or withdraw account facilities. G) Customers who choose to make their own hosting arrangements must pay 100% payment upfront and check with Warwick Web Design that their chosen hosting package is compatible with Warwick Web Design’ software. Warwick Web Design will not be held responsible for any problems that are encountered due to hosting that has been arranged by the customer. If hosting has been arranged by the customer Warwick Web Design are not responsible for any further payments that may incur to upgrade or change the customer’s current hosting package. A) All 12 month contracts expire 12 months after the date that an order was placed. This includes hosting, domain names, emails, Search Engine Optimisation (SEO), maintenance and other annual packages. If a customer wishes to stop using Warwick Web Design’ services after the agreed contract period it is their responsibility to cancel any standing orders, otherwise Warwick Web Design will continue to carry out the monthly work that was set out in the initial order. Warwick Web Design will not give any refunds to customers who have forgotten to cancel their standing orders. B) Warwick Web Design have the right to cancel all services if the customer has not made a renewal payment within 30 days of the agreed renewal date. This includes the cancellation of domain names. A) The property and title to the goods shall remain with Warwick Web Design, until such time as all sums owing for and in respect of the goods have been received from the customer by Warwick Web Design. A) All content including designs and artwork remain the property of Warwick Web Design until they are paid for in full. We reserve the right to use design styles and methods in multiple applications and for a variety of usage unless stipulated in writing by an Warwick Web Design at the time of orders placed. B) Some products provided by Warwick Web Design will contain materials, such as images, that have been purchased from third parties. 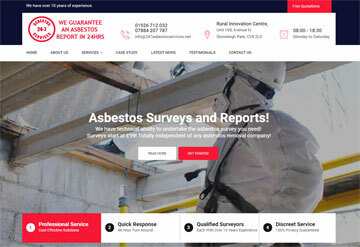 Warwick Web Design purchase a licence to use these materials but does not own them and therefore once a customer has paid Warwick Web Design in full the customer does not have ownership of these materials. C) Warwick Web Design will not put a website live until it has been paid for in full. D) Some of Warwick Web Design services can be paid for on a monthly basis (including SEO). This is to be paid by standing order on the 1st of the month using the account details provided by Warwick Web Design. These services are based on a 6-12 month contract. All web related content including designs and artwork remain the property of Warwick Web Design until the full 12 months have been paid for in full. Until then, Warwick Web Design have the right to suspend the customer’s website and any other additional services. E) Warwick Web Design should be made aware of sensitive data when the order is placed as Warwick Web Design cannot be held responsible for data theft or copying unless notified in advance. F) Once a website has been completed and all payments due have cleared the website and all of its content is solely the responsibility of the customer. For example, if the website does not pass W3C standards Warwick Web Design will not be held responsible. Any content that goes against copyright and any other laws will also be the customer’s responsibility. G) Warwick Web Design cannot be held responsible for any technical problems that affect the appearance and functionality of a website due to software upgrades. This also includes new additions of web browsers and other advances in technology. After we have received the full payment any changes to a website will incur an additional cost. H) Warwick Web Design will only perform browser testing in Internet Explorer 8 and above, Firefox 4 and above, Safari 6 and above and Opera 11.61 and above. I) Warwick Web Design will only test HTML emails in what they class to be the most popular email clients and cannot be held responsible for any differences in design from one email client to the next. A) Warwick Web Design is a small business, to remain efficient we must ensure that work we have programmed is carried out at the scheduled time. On occasions we may have to reject offers for other work and enquiries to ensure that your work is completed at the time arranged. B) This is why we ask that you provide all the required information in advance. On any occasion where progress cannot be made with your website because we have not been given the required information in the agreed time frame, and we are delayed as result, we reserve the right to impose a surcharge of up to 25%. If your project involves Search Engine Optimisation we need the text content for your site in advance so that the SEO can be planned and completed efficiently. C) If you agree to provide us with the required information and subsequently fail to do within four weeks of project commencement we reserve the right to close the project and the balance remaining becomes payable immediately. Simply put, all the above condition says is do not give us the go ahead to start until you are ready to do so. D) NOTE: Text content should be delivered as a Microsoft Word, email (or similar) document with the pages in the supplied document representing the content of the relevant pages on your website. These pages should have the same titles as the agreed website pages. Contact us if you need clarification on this. A) While Warwick Web Design will use its best endeavours to meet any stated delivery dates, time shall not be the essence of the contract and Warwick Web Design shall not be liable for any loss or damage whatsoever, resulting directly or indirectly from late completion. B) Warwick Web Design cannot be held responsible for any type of data or financial loss. This includes viruses, hacking and administrative errors. It is the responsibility of the customer to check for technical and visual errors on all websites. This includes ensuring that product and service descriptions as well as tax, delivery and other charges are correct. Warwick Web Design cannot be held responsible for any of the above errors. C) Warwick Web Design cannot be held responsible for the loss or damage of files or data during the transfer of a website from an existing host. It is the customer’s responsibility to ensure that all files and data are backed-up. D) Warwick Web Design takes hacking / attacks / viruses and any type of malicious intent to customer’s websites very seriously. Warwick Web Design cannot be held responsible for any type of loss during a hack / attack or there malicious intent and it is the customers responsibility to take measures to restore their website. During a malicious attack the website may be taken offline until it can be seen safe to be put back online. B) Customers who have signed-up for a pay per month package, must ensure that a payment is made on or before the 20th of every month, unless another date has been agreed in writing by an Warwick Web Design. C) By agreeing to the contract/proposal SEO customers automatically give their permission for Warwick Web Design to put links on their website to other company websites. This is to aid the service that we offer. D) By signing the order form SEO customers automatically agree to allow Warwick Web Design to give out their personal business details including contact name and contact details to other companies. This is to aid the service that we offer e.g. submitting to certain directories. E) SEO customers will not be allowed to change their key phrases until the agreed contract period has come to an end without prior agreement from Warwick Web Design. G) For customers on any type of SEO package, Warwick Web Design do not guarantee what position on Google’s search results pages a customer’s website will appear and are not liable for any business lost due to rankings drop that may occur due to e.g. change in google`s algorithms or competition ranking increase. H) All maintenance packages (unless otherwise agreed in writing by Warwick Web Design) include up to 2 hours worth of website updates per month. I) All maintenance and natural SEO packages do not allow for updates to be made to the layout and design of websites. A) Warwick Web Design have a multiple reseller account with UK based hosting companies. Customers that sign-up for a hosting package with Warwick Web Design acknowledge that Warwick Web Design use a third party company for their hosting services. B) Warwick Web Design’ standard web hosting comes with 500MB of web space, 400MB of email space and 5 My SQL databases and the cost is £7.50p/m (12mths payable in advance). If customers exceed theses limits or require additional hosting services they may be charged accordingly. C) Warwick Web Design have the right to charge a customer an additional fee if Warwick Web Design feel that the customer’s website is using up an excessive amount of bandwidth. D) A £50 transfer fee maybe applicable for the transfer of any domain away from our domain registrar. If the domain wants to be transferred away within the first year while enjoying the first year free hosting option, then a charge of £75 maybe applicable for transfer to cover admin fees etc. A) All website design packages can include 12 months free hosting from the date an order is placed. After this 12 month period if you wish to continue having your hosting setup by Warwick Web Design you will be required to pay an annual fee. Warwick Web Designs has the right to change this fee at any given time. B) If customers opt for Warwick Web Design to setup hosting for their website, Warwick Web Design has the right to charge an additional fee if your website’s bandwidth or file space exceeds what Warwick Web Design considers reasonable. D) Warwick Web Design cannot be held responsible for the failure of email setups on computer, phone or other electrical devices. F) Minor updates and amendments to content will incur a charge starting from £60 i.e. a minimum charge of 1hr(minor work will require full payment upfront). During the website build we reserve the right to suspend the account if we do not receive approval and/or feedback within 6 months from the date that we were last supplied work from the client, this also applies to requesting content for the website to be supplied by the client. In order to re-open the project with Warwick Web Design we will charge £300 to reschedule resources for the project. If the project remains suspended for three or more months, we then reserve the right to permanently close the project. At the time of closure the project will be closed completely, all money paid to us will be forfeited in its entirety and Warwick Web Design will owe the client no further obligation in terms of completing the website project. This term relates to projects at any stage of build; deposit, prototype/wireframe, design delivered and site delivered.